JUST HOLDENS is the only magazine always featuring Holden’s golden era of classics, muscle and chrome. 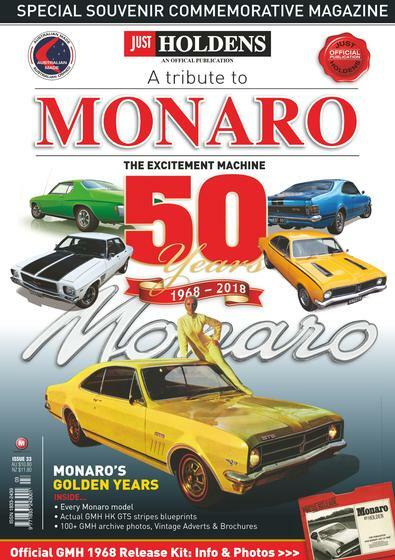 This is a magazine like no other - Monaro, Torana, Kingswood, Brockies, HSV, Statesman, Premier, Earlies and more – they're all here from Holden’s earliest beginnings. JUST HOLDENS is informative and educative. You will read about the greatest Holdens ever built and see photos never seen before. For all lovers of Holdens of all ages – JUST HOLDENS has the lot. This is a must for real Holdens enthusiasts! JUST HOLDENS is the ultimate magazine for true-blue, dinky-di Holden enthusiasts! IT'S GOT THE LOT IN EVERY ISSUE! ... forget the others - there is nothing else like JUST HOLDENS! FREE POSTER will be lightly folded and inserted with your first magazine. EXCLUSIVE SPECIAL & BENEFITS OFFERS for all Subscribers. QUARTERLY PUBLICATION - every three months. Depending on your purchase date; your first issue will come within a three-month time span. GIFT CERTIFICATE - if this Subscription is a gift JUST HOLDENS can email you a Gift Certificate for you to give the recipient on their special day (by notifying JUST HOLDENS of this requirement). EXTENDED TERM - your 8-issue subscription term covers two years. I bought this subscription for my husband and he absolutely loves it and says its the best holden magazine he has ever read. Found it great ! Very detailed info and the picture content takes you back in time . If you love Holden or muscle cars this is the mag to add to your collection. For quarterly titles please allow up to 1-2 weeks for your first delivery. Your subscription will begin with the next available issue.